Many years ago, while reading Anne Mellor's biography of Mary Shelley, I encountered her opinion of Percy’s use of a pet name for Mary. The name was “pecksie”. In Mellor’s opinion, this demonstrated “that he did not regard his wife altogether seriously as an author”. Cue my head exploding. Most scholars, but not all, looked upon these pet names and comments as benign, even endearing. But remarks such as Mellor's were enough to fuel a controversy that persists to this day. I might also add here that the “young woman” in question was the daughter of no less a personage that Mary Wollstonecraft (the author of Vindication of the Rights of Women) and William Godwin (the author of Political Justice). Intellectually, she was a match for PB. Even more interesting is the fact that, as Anna Mercer demonstrates, in the Shelley household, the term “pecksie” was applied by each partner to the other! For example, in a letter from 1815, Mary asked Percy to return one of her possessions, if he fails to do so, Mary tells him fondly, "I shall think it un-Pecksie of you". This suggests that “pecksie” might have been more than just a pet name and rather a term that represented a constellated set of attributes. We might therefore be interested in what exactly it means to be “pecksie”; what behaviours or patterns of conduct fall into the category of “pecksian”? I think I am now in the position to shed some light on this! So, let’s look at the origin of the term "pecksie". We begin again with Nora Crook suggests that it is "the name of the industrious bird in Mrs. Sherwood's The History of the Robins". Mary Martha Sherwood was an incredibly influential, best selling writer of children's literature in 18th and 19th century England. She was also an inveterate christian evangelist and proselytizer – which makes her books unlikely source material for the atheistical PB Shelley. But is Sherwood the source of the nickname? No. In this, Crooks is unfortunately mistaken. The author of The History of Robins is not Sherwood, it was in fact Sarah Trimmer as Judith Barbour has pointed out. 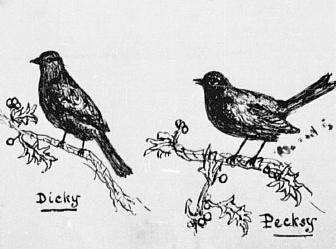 And the correct spelling of the little robin’s name is in fact “Pecksy” and not "pecksie". Trimmer was in her own right an extremely famous children's author. Originally titled Fabulous Histories, Trimmers' book was continuously in print and a favourite of parents and children alike until after the First World War. After 1820, the book came to be known as The History of Robins or more simply, The Robins. Trimmer aimed to teach these lessons by presenting the reader with two families, one of humans and one of robins. Both families, individually and through their interaction, are a microcosm of society. The reader is meant vicariously to learn the proprieties of family life and of behaviour to other parts of God's creation through the education by their respective parents of the two human children, Harriet and Frederick, and the four robin nestlings, Robin, Dicky, Flapsy and Pecksy. The human family, the Bensons, is fairly typical of the usual inhabitants of moral tales. They are affluent and landed. There is a largely absent father, and a loving if somewhat stern and pontificating mother. And there is one obedient and thoughtful child, Harriet, and another, younger sibling, more imprudent and thoughtless, but good at heart and responsive to a painstaking education. Though the family of robins was constructed on similar lines, with doting but stern parents and a brood which ranged from the docile and considerate Pecksy to the rash and conceited Robin, is was surely their presence which secured the book's lasting popularity. Which brings us to the question of what it might mean in the Shelley household to be “pecksian”. I do not want to over play this hand, but if it is true that both PB and MW aspired to behave in a manner consistent with a set of "pecksian traits" and reproved one another when they failed to, it is worth while trying to understand what those traits were. It could tell us a surprising amount about the two of them. Nora Crook would have us believe such behavior would be characterized as “industriousness”. However, having read a fair portion of Fabulous Histories, I think Pecksy’s personality is typified by a very different set of personality traits: she is obedient, amiable, self-effacing, considerate of others, self-sacrificing and a peacemaker. The four nestlings from Fabulous Histories: Dicky, Pecksy, Flapsy, and Robin. “‘I have been unhappy my dear mother’, said she, ‘but not so much as you suppose; and I am ready to believe that my dear brothers and sister were not in earnest in the severe things they said of me -- perhaps they only meant to try my affection. I now entreat them to believe, that I would willingly resign the greatest pleasure in life, could I by that means increase their happiness; and so far from wishing for the nicest morsel, I would content myself with the humblest fare rather than any of them should be disappointed.’ This tender speech had its desired effect it recalled those sentiments of love which envy and jealousy had for a time banished; all the nestlings acknowledged their faults, their mother forgave them and a perfect reconciliation took place to the great joy of Pecksy, and indeed of all parties”. Later, Pecksy brings her mother a spider to eat. Her mother approvingly remarks, “How happy would families be if everyone like you, my dear, Pecksy consulted the welfare of the rest instead of turning their whole attention to their own interest”. Readers familiar with the values both PB and MW came to cherish and extol in their poetry and prose will not be surprised, I think, to see in the character of the little robin called Pecsky an intimation of what was to come. That they themselves strove to behave in a “pecksian” manner and reproved one another when they failed (“I shall think it un-Pecksie of you.”) also tells us something about the value system operating in their home. And can we go so far as to say PB's closing lines to Prometheus Unbound are pecksian? Too far?? Okay....maybe a wee bit! But you smiled...I know you did. And there is another value system at operation here: the humane treatment of animals. Trimmer's book was subtitled "The Instruction of Children Respecting Their Treatment of Animals". While Trimmer was no vegetarian (she approved of the killing of animals as long as it was done "not without reason") she nonetheless sought to inculcate in children a benevolence toward animals. Fabulous Histories is an excoriating morality tale in which those who torment animals are harshly punished. For me it is easy to trace a developmental arc for a sensitive child such as PB: from values such as these encountered in childhood, to the full blown vegetarianism of his adulthood. To me, investigations like this are an eternal delight. We start with an uncharitable aspersion cast at our poet by a critic – all because he used a pet name for his lover. We are led to a delightful essay by a leading Shelley scholar and from thence first to the wrong book, but then to the right one. Along the way, we discover two largely forgotten giants of early children’s literature - Mary Sherwood and Sarah Trimmer. We finally arrive at a little robin – a nestling who embodied a set of character traits that came to be valued and extolled by two of the great writers of the 19th Century. Not a bad excursion. Tell me that wasn't fun!! All aboard for the next one? Newer PostJeremy Corbyn is Right: Poetry Can Change the World.